The BEST gooey Nutella Chocolate Lava Cake Recipe you’ll ever make. Easy to follow instruction with maximum chocolate flavor. Topped with Champagne Muddled Raspberries, a decadent dessert for two perfect for date night or Valentines Day! Preheat oven to 395 degrees. Grease two small ramekins (8 oz. ramekin) with butter and dusk with cocoa powder. Set aside. In a large bowl, add egg, egg yolk, and sugar. Whisk until sugar is dissolved, about 2-3 minutes. Set aside. Add butter and semi-sweet chocolate to a bowl, put in microwave for 45 seconds to 1 minute. Remove from microwave and stir until chocolate and butter is completely melted. Add cocoa powder to the egg sugar mixture. Whisk to combine. Add a little bit of warm chocolate mixture to egg sugar mixture, whisk to combine and temper the eggs. Add the remaining chocolate, stir to combine. It should feel like a thicker batter consistency now. Fill up two ramekins halfway with chocolate batter. Top each ramekin with the remaining chocolate mixture. Place ramekins on a baking sheet and bake for 15 minutes in the oven. (the cake should spring back a little when you touch it. In the mean time add raspberries and champagne to a small bowl, using a fork, mash the raspberries up and let sit for 5 minutes to let the champagne soak in. 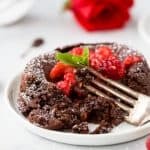 Remove chocolate lava cakes from the oven, using a butter knife, gently go around the outside edge then gently flip the lava cake out of the ramekin onto a plate. Serve with muddled champagne raspberries on top!